Facebook’s CEO, Mark Zuckerberg, visited Ford Motor Company as part of his “Personal Year of Travel Challenge” to get out and talk to more people about how they're living, working and thinking about the future. In choosing to come to Michigan this week, he met with Ford employees to learn about their work and how they are incorporating new technology and innovation into design, product development, and manufacturing. According to a Facebook post by Zuckerberg, he got to play "a very small part in assembling some new Ford F-150s on the line by adding antennas, cleats, and drilling screws. I even signed the inspection sticker on one. You're welcome, future F-150 owner." 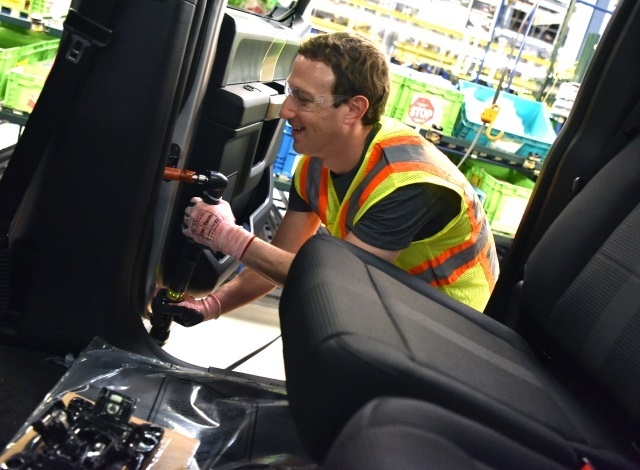 Zuckerberg added that it was his first time in Michigan, and his first stop was at the Ford Rouge Plant outside Detroit. "Working on the line at an assembly plant is physically hard, and the people I met talked about how tiring it is and how worn down you get. Each person told me separately how important it is to have good shoes because you're essentially walking on a treadmill for 10 hours a day. Every 52 seconds, you have to go through your set of tasks -- 650 times a day. You have to be perfect, but the biggest challenge is having the focus to do the same thing over and over again. The people I met are so good they keep the line running at full speed and listen to audio books or music in one earbud to stay engaged," Zuckerberg said in his post. "Working at Ford is a long term thing. Most of the workers I met had been at the plant for at least a decade, and a lot of them have kids and friends who work there, too. Someone told me that when you spend 11 hours a day, four days a week together, you end up becoming family and friends outside of work, too."